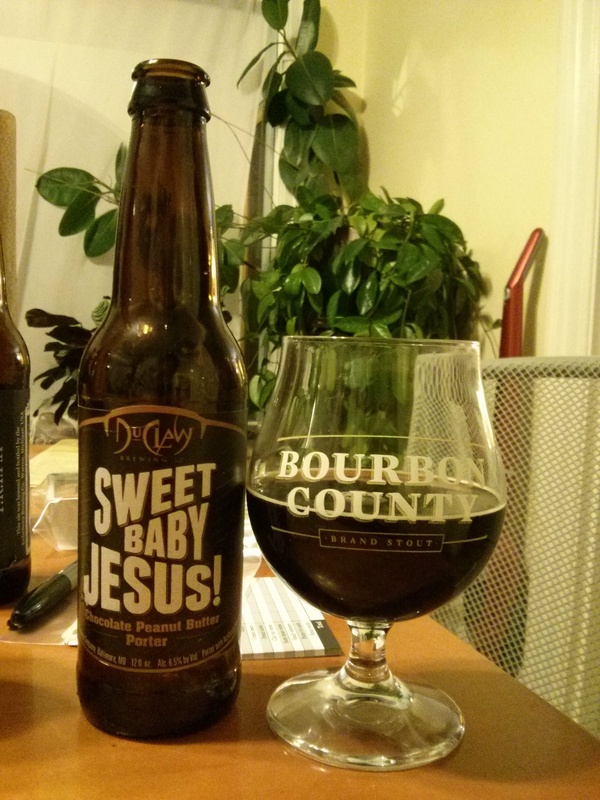 DuClaw Brewing’s Sweet Baby Jesus is a chocolate peanut butter porter with an intense peanut butter aroma. The smell is a bit over-powering and also has an odd fake, sweetness to it. This carries over to the taste as well, while extremely peanut-buttery it tastes a bit too artificial for my liking. The beer poured a dark brown, as most porters do. It had little head that dissipated very quickly although a small, white lacing did stay on the top of the beer for a good half hour after being poured. Again, the aroma is intense. It is overwhelmingly peanut butter but if you look past that you can get the chocolate and caramel notes, too. This beer is one that actually tastes exactly how it smells, no hidden flavors or aromas. This is a chocolate peanut butter porter and it tastes as expected. Sweet Baby Jesus lacks any texture to it, that is one of its downfalls. The beer is watery and thin, with something so rich in flavor and aroma your mind plays tricks on you making you believe that this drink will be velvety but that is something it lacked. Overall, the cloying sweetness of Sweet Baby Jesus was a tad much for me. We shared a 12-ounce bottle between three people and that amount was just right, I could not imagine drinking an entire 12-ounce bottle by myself. This beer does seem like it would make a great accompaniment to a dessert or perhaps would be fantastic baked right in to some brownies.